With any luck, you were able to catch one of the three recent Theatre 308 performances of Thornton Wilder’s Our Town. This metatheatrical piece, written in 1938, redefines the word “play”. It is a piece that seems aware of its theatrical setting, and draws on its own nature to help direct its message. The show is narrated by The Stage Manager, props are cut to a minimum, and audiences are drawn closer than ever through their active role in the show. The show has a deeply personal nature, following the lives of two young lovers in a small American town. Each audience member can recognize a fragment of themselves and their lives in the simplistic, but deeply representative plot. It is for this reason, perhaps, that Our Town is one of the most commonly performed plays among high school theatre companies. Theatre 308’s production, however, strives to distinguish itself from the masses. The seats themselves, about 200 per night, were located on the stage. “The chance to stage the play in a black box theater style, with the audience onstage surrounding the action, is entirely different from what we’ve done in any recent production. 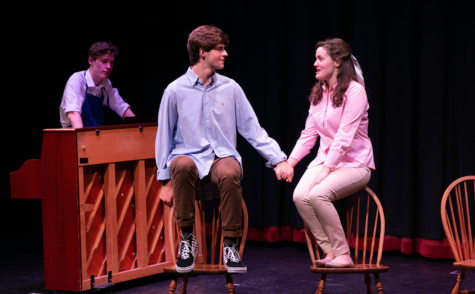 We’re able to dive deep into the acting and emphasize the community aspect of the play through connection with the audience,” says 308 director Mr. Regan. Seats were limited to less than 200 per night, the play itself taking place inside a ring of seats, the curtains closed to the house. This forces the audience to get personal with the action on a literal level, but it also permits them no distractions from the complicated issues raised in the very text of the play. Rejan says, “Our Town is about the larger questions that are present in our lives but that we sometimes don’t face directly. 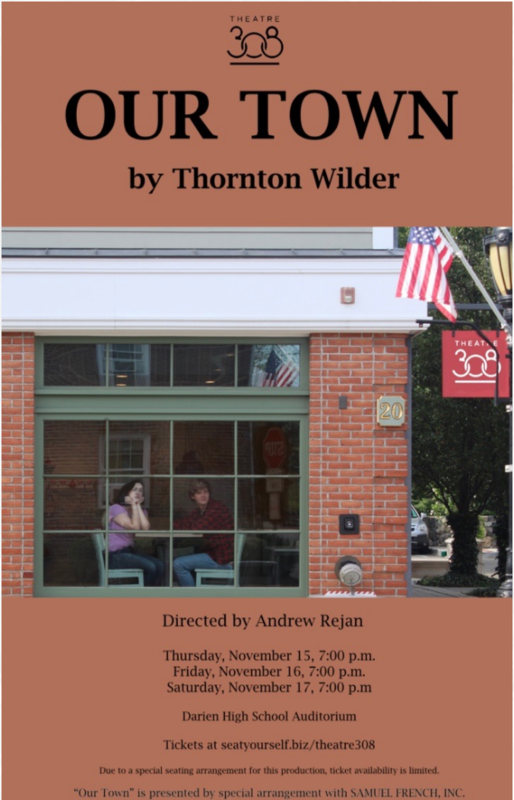 In particular, the play is about what it means to be present and really notice ourselves, other people, the world around us—about how easily human beings can get absorbed in routine and lose sight of the bigger picture.” In the setting of Theatre 308’s production, it becomes difficult not to face these questions directly, forcing audiences to ponder Thornton’s intended answers. Neirad reached out to junior Natalie Vasileff, head of sound design and fellow journalist, for information on the unique way sound is used in this production. “The sound design for Our Town is unique because it’s all live and in the moment” said Vasileff. “There are no recordings or microphones at all… only physical supplies that we use backstage to deliver the best sound that can be made.” Various tools used to provide sound effects include a trumpet, hot plate, and coconut shells. This unique approach to sound design “really shows the raw authenticity and value of love and community in the play,” says Vasileff, whose interesting techniques add yet another layer to the metatheatrical individuality of the piece.